Consciousness is a tricky subject and how we come to be aware of ourselves is something not well understood. 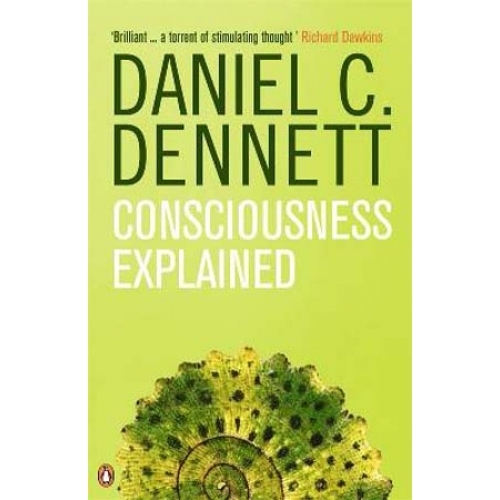 In Consciousness Explained Daniel C. Dennett explores the idea that consciousness is not something extra in us, that it is, instead, a by product of how our brains work. First, Dennett dismantles the ghost in the machine argument. This is the idea that the mind is different to the brain/body which leads to the idea of a soul that continues after we die. It’s an observer, a translator of the processes in the brain, a someone that makes decisions, holds beliefs, acts. Then the book explores what else it might be that creates our sense of self and how it might have evolved. Along the way, we learn a lot about the state of the science of the brain (or at least where it was in 1991 when the book was published, I imagine it’s moved on some way) and how things really work. There’s a lot of time spent looking at how vision works. I always thought that the eye fills in the gaps created by the pupil, but actually it doesn’t. It doesn’t have to fill in anything because it’s not recognizing the gap. So, what’s left if there’s no ghost in the machine? No soul? Well, Dennett says that consciousness is a by-product of language and evolved because we tell stories. We are figments of our own imaginations, fictional characters in the story of our lives. Which, as a writer, I find charming. This is a hard read, no question. It’s a real work out for your brain muscle and I felt very virtuous reading it. I highly recommend it if you’re interested in knowing how your brain works, but I won’t lie, it takes some reading. Hi I’m looking for your contact info for a book review/post?